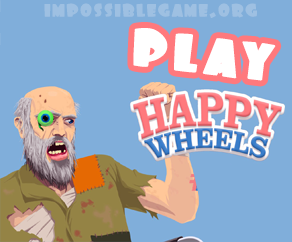 Finally our users can enjoy one of the most exciting games online, Happy Wheels. You will enjoy its bloody super engaging game-play with exciting sound music and sound effects. There are lots of blood and terrific killing scenes, but game is so funny that if you play it with your friends none of you will stop laughing. Happy wheels is created by Jim Bnacci and millions of users give huge thanks because of such an exciting game. Playing the game you will enjoy racing, blood, crashing and overcoming super difficulties, but the interesting is the fact that the game is based on physics, so unreal things may happen but remember, nothing is unreal for real physics!